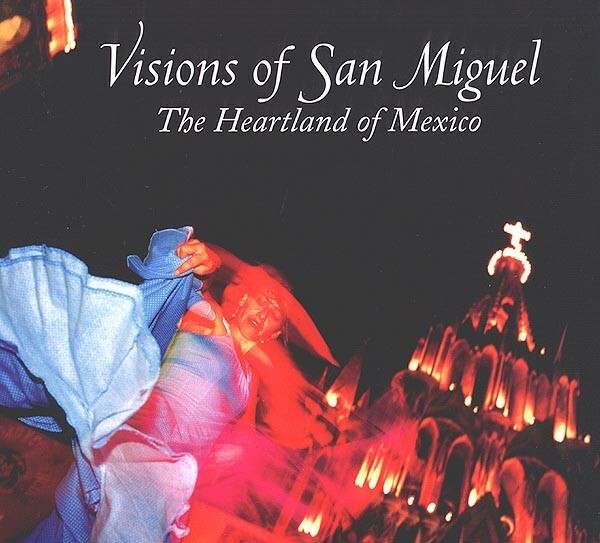 “Visions of San Miguel. The Heartland of Mexico”, a book about San Miguel de Allende in Guanajuato, portrays the city, its people and its fiestas, as seen through the lenses of thirty talented photographers. This visually exciting book is an ideal introduction to San Miguel de Allende for the armchair traveler, or a perfect memento for anyone who has visited this splendid city. All four sections of the book are of interest to geographers, not only because they provide a visual guide to many aspects of the city, but also because they reveal some of the reasons why San Miguel has become a popular retirement location for Americans and Canadians. “Foundations of Greatness”, the first of four sections, opens with a wonderfully atmospheric untitled black-and-white photo (taken by Bill Begalke) showing the town center emerging from the overnight mist. A short selection of historical photos, some dating back to 1870, causes one to muse on just how far the city has progressed (in every way) since then. 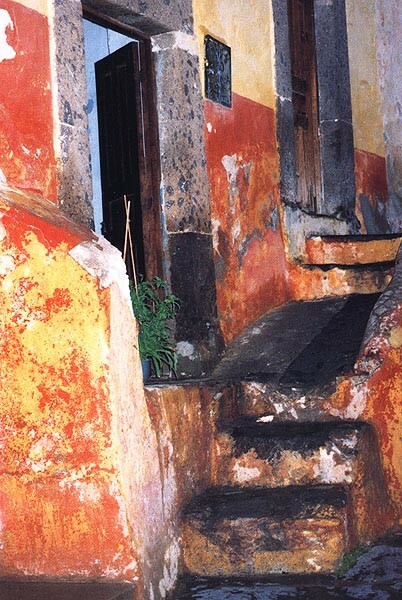 The second section, “Cobblestones of Color”, explores the textures and hues of San Miguel. Images range from the earthy tones and patina of an ancient doorway (Glenda Kapsalis), to the brilliant purple jacaranda trees in spring (Dixon Adams); from the elegant interior of the Casa Luna dining room (Douglas Steakley) to an open-air artist putting the finishing touches to a painting of Aldama Street (Atención). There’s a nice design touch here: the next page is a photo (Amanda Moulson) of the view enjoyed by the painter! Two photos (Chuck Jones) show important murals, whilst others show fascinating exteriors of colonial buildings. A fabulously evocative “abstract street scene” (Elsmarie Norby) captures the very essence of San Miguel for anyone who enjoys strolling the back streets, admiring the design, the architecture, the sense of color, the peeling walls. Several portraits enliven this section. A formal study of a “quinceañera” (Sondra Zell) at her coming-of-age party is next to a strong portrait of a particularly thoughtful older woman (Jill Genser). A sense of fun and humor pervades several of these photos. The children bathing in tubs at the public laundry (Don Wolf) are certainly enjoying themselves and it looks like the two young children asking a woman about a chicken (Ed Foley) might be about to take on more than they can handle! Don Eduardo, woodcarver and folk artist (Jennifer Haas) is apparently finding the whole business of having his photo taken an enormous joke, while deep in conversation, two flower vendors (Ned Brown) are seemingly oblivious to the photographer as they catch up on the latest news. The third section, entitled “Fiestas, Fiestas and More Fiestas”, is by far the largest section of the book. Any thought of imbalance is quickly dispelled as an endless stream of fiestas is paraded past the reader. The selection begins with mid September’s Independence Day celebrations and the whirling fireworks of a castillo (Fred Edison). An action-packed street scene of the running of the bulls by the same photographer highlights the exuberant activities of the San Miguelada held the following weekend. This leads into colorful photos of the fiesta for the town’s patron saint at the end of September. A plumed Indian headdress (Ed Foley) suggests the richness of the costuming. November’s Day of the Dead commemoration amongst the decorated gravestones is luminously captured in the photo “Mountain Light” (Galen Rowell). Colorful scenes from the Day of the Revolution and Christmas pageants follow, but the largest number of photos relate to the Easter celebrations when San Miguel re-enacts the Easter story along flower-carpeted streets. A photo of two elderly ladies in black lace under the cross is a classic portrait of piety (Sue Beere). The Fiesta section concludes with an informal study of the “Blessing of the cowboys and horses” (Richard Kriegler) and a stately photo of one of the world’s least likely events, the “Blessing of the taxis” (Peter Olwyler). The fourth section, “La Parroquia, Icon of the Heartland”, focuses on the Gothic Church of St Miguel which dominates the town landscape. Ancient and modern appear side by side: old drawings of the parish church followed by a variety of exterior and interior shots depicting the real thing as we see it today. The quality of design (by Patricia Anne Tripp) and reproduction is extremely high. The book appears fault-free, barring a handful of missing accents on some Spanish words such as jardín. This is a memorable book. The photos capture the essence of this vibrant, historic city, but go way beyond that by reminding us of so many uniquely-Mexican sights, sounds, events and personalities. A keeper! 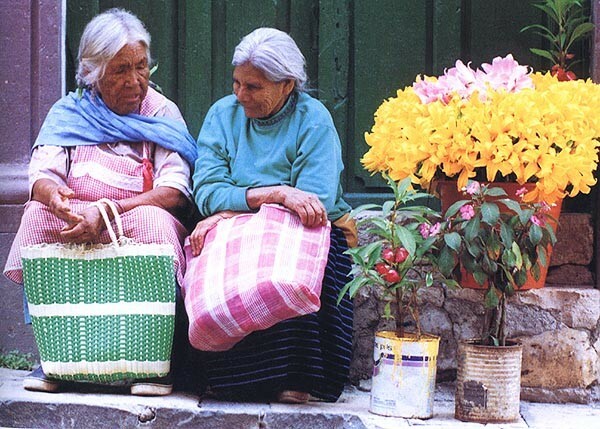 why do foreigners sentimentalize Mexico so very endlessly…. For anyone going to San Miguel and needing transportation to and from the Airports in Queretaro, Leon or Mexico City or to other towns and sights to see in the area, we highly recommend Reyes Ortiz. He is not only a very pleasant person but a good businessman. He speaks very good English, is very knowledgeable and informative of San Miguel de Allende and the other cities, towns and attractions in this part of Mexico and has very reasonable rates. He also gives tours to Dolores Hidalgo, Queretaro, Atotonilco, Guanajuato, Mexico City and other sites. We used another transportation service earlier, then tried Reyes and we continued to use him for the duration of our trip. He was a tremendous help and delightfully informative. We will definitely be using his services everytime we return to San Miguel.